The idea that one of Hamas’ main command bunkers is located beneath Shifa Hospital in Gaza City is one of the worst-kept secrets of the Gaza war. So why aren’t reporters in Gaza ferreting it out? The precise location of a large underground bunker equipped with sophisticated communications equipment and housing some part of the leadership of a major terrorist organization beneath a major hospital would seem to qualify as a world-class scoop—the kind that might merit a Pulitzer, or at least a Polk. But Booth is no rookie—he’s an experienced foreign reporter, which means that he buried the lede on purpose. Why? Well, one reason might be that the “security sources” quoted whenever the location of the Hamas command bunker is mentioned—which, as evidenced by this 2009 article by the excellent and highly experienced foreign correspondent Steven Erlanger of the New York Times, happens every time there’s a war in Gaza—are obviously Israelis, not members of Hamas. It might be hard to believe the Israelis, the simple logic might run, since they obviously have an investment in arguing that Hamas is using hospitals and schools as human shields. The Israelis are so sure about the location of the Hamas bunker, however, not because they are trying to score propaganda points, or because it has been repeatedly mentioned in passing by Western reporters—but because they built it. Back in 1983, when Israel still ruled Gaza, they built a secure underground operating room and tunnel network beneath Shifa hospital—which is one among several reasons why Israeli security sources are so sure that there is a main Hamas command bunker in or around the large cement basement beneath the area of Building 2 of the Hospital, which reporters are obviously prohibited from entering. Hamas obviously has no interest in having a photo-layout of one of its command bunkers beneath Shifa Hospital splashed on the front pages of newspapers. After all, such pictures would show that the organization uses the sick and wounded of Gaza as human shields while launching missiles against Israeli civilians. What Hamas wants is for reporters to use very different pictures from Shifa—namely, photos of Palestinians killed and wounded by Israelis, which make Palestinians look like innocent victims of wanton Israeli brutality. 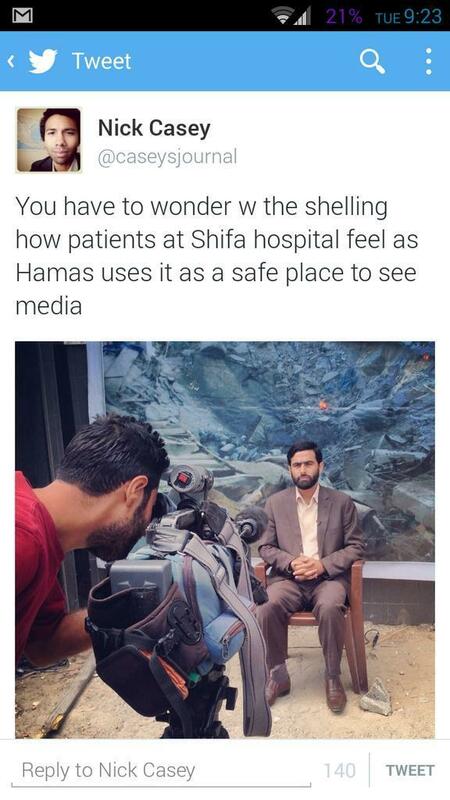 To that end, the rules of reporting from Shifa Hospital are easy for any newbie reporter to understand: No pictures of members of Hamas with their weapons inside the hospital, and don’t go anywhere near the bunkers, or the operating rooms where members of Hamas are treated. While reporters can meet with members of Hamas inside the hospital—because it’s obviously convenient for everyone—they are not allowed to take pictures. Reporters inside Gaza who are risking their lives to bring the world whatever news they can should hardly be blamed for obeying Hamas’ media rules, which the organization has helpfully written down in case anyone has doubts about what they are permitted to show. Reporters who bravely or foolishly violate Hamas’ rules even on their social media accounts can be seen to repent with such alacrity that it’s not difficult to imagine how scared and dependent they are. Nick Casey of the Wall Street Journal, for example, tweeted that “You have to wonder w the shelling how patients at Shifa hospital feel as Hamas uses it as a safe place to see media.” Casey then quickly deleted his tweet, which didn’t save him from being put on a list of journalists who “lie/fabricate info for Israel” and “must be sued” – a threat which is surely the least of Casey’s fears. Last week, French-Palestinian journalist Radjaa Abu Dagg was summoned to Shifa by Hamas and interrogated. He wrote about the experience of “attempted intimidation” for Liberation—and then quickly had the paper take down the article. It can hardly be lost on any sane journalist that tempers in combat zones can be short, and that Hamas has used the kidnapping of foreign journalists like Alan Johnson of the BBC to advance its own agenda. The fact that Hamas has closed the border and will not let journalists in or out of Gaza can’t make journalists who being used as de facto human shields by a terrorist organization feel any more eager to offend their hosts. What Hamas has done, therefore, is to turn Shifa Hospital into a Hollywood sound-stage filled with real, live war victims who are used to score propaganda points, while the terrorists inside the hospital itself are erased from photographs and news accounts through a combination of pressure and threats, in order to produce the stories that Hamas wants. So if reporters aren’t entirely to blame for participating in this sick charade, then who is? The answer is that reporters write what they can, and some do their job better than others, and some are braver or more foolhardy than their peers. But it’s the job of editors, sitting thousands of miles away, at a very safe remove from the battlefield, to note that dispatches were produced under pressure, or that key information was removed by a government—as nearly all mainstream media outlets do when battlefield dispatches pass through the hands of the IDF censor. A good editor might attach similar notes to dispatches from combat zones controlled by terrorist organizations. He or she might also decide that reporting only the news that Hamas deems fit to print from Shifa Hospital isn’t actually reporting at all: It’s propaganda.